The stamps A Rose is a Rose is a stamp set by Stampin Up it is a two stamp technique you stamp the lighter shade ink for the block base then the darker shade ink on the detail stamp and stamp directly on top of the first image, it gives a wonderful effect. Once stamped I cut out the images and mounted them onto the card using dimensional foam pads. 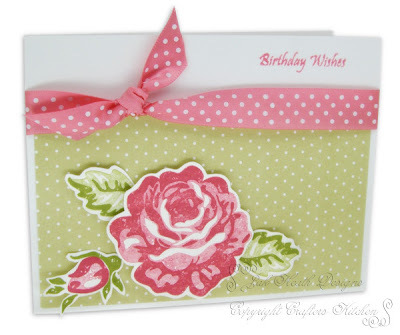 The base card was made by adding some polka dot paper and ribbon by PTI and stamping the sentiment in the lighter shade pink ink used on the rose. Love this one, Jak. What a perfect card for a Spring/Summer birthday. This is really lovely Jak. The rose looks just like one of Anna Griffin's beautiful flowers. Simply elegant or.... elegantly simple. 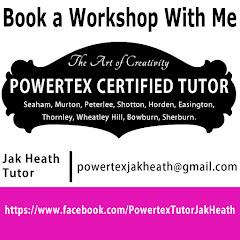 wow this technique makes a really stunning card Jak, really enjoyed chat with you at washington shop on wednesday. Absolutely stunning Jak, Green & Pink are two of my faovourite colours and i just love them together. Very pretty card, love your artwork! TFS! Lovely card Jak I have these stamps my daughter bought them for me for Christmas only used them once.